A large neotropical clade of grass and bamboo-feeding satyrines. There are several apparent subclades–a south-temperate group of genera, and three mainly Andean clades with their main diversity occurring above 2000 m. Many species remain undescribed. The informal name of the "erebiine" clade is derived from the hypothesis of Viloria (2003; 2007) and Lamas & Viloria (2004) that a group of taxa formerly included in Pronophilina (e. g. Miller 1968) is more closely-related to the holarctic Erebiina. The cladogram of Peña et al. (2006) and unpublished data (Brower, Wahlberg) do not support that hypothesis, but do support these taxa as a monophyletic group within Pronophilina. The list of included genera is inferred from relationships implied by the molecular phylogenetic hypothesis of Peña et al. (2006). However, the circumscription of Pronophilina has been viewed more narrowly by Viloria (2007) and Lamas et al. (in Lamas 2004), to include only the primarily Andean genera plus the Antillean Calisto, based on the presence of hairy eyes and two wing venation characters. These authors place the "Lymanopoda group" in Erebiina and the south temperate clade in Hypocystina (Coenonymphina in this classification). However, the molecular data do not support these hypotheses. More extensive sampling is needed to increase support for one or the other of these alternatives. Hayward KJ. 1953. Satiridos Argentinos (Lep. Rhop. Satyridae) I. Los generos (excluido Euptychia y Neomaniola). Acta Zool. Lilloana 13: 151-159. Hayward KJ. 1958. Satiridos Argentinos (Lep. Rhop. Satyridae) II. Los géneros (continuación). Acta Zool. Lilloana 15: 161-182. Lamas G and Viloria A. subtribe Erebiina. in Lamas G ed. 2004. Checklist: Part 4A Hesperioidea - Papiionoidea. Gainesville: Scientific Publishers/Association of Tropical Lepidoptera. Pyrcz TW. 1995. A new genus, Tamania, and a new species, Tamania jacquelinae, from the Tama Range, Venezuela Colombia border, and some thoughts on the diagnosis of the tribe Pronophilini (Lepidoptera: Nymphalidae: Satyrinae). Lambillionea 95: 519-525. Peña, C., N. Wahlberg, E. Weingartner, U. Kodandaramaiah, S. Nylin, A.V.L. Freitas & A.V.Z. Brower. 2006. 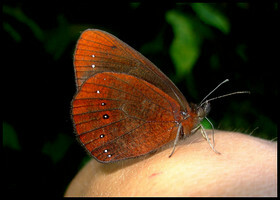 Higher level phylogeny of Satyrinae butterflies (Lepidoptera: Nymphalidae) based on DNA sequence data. Molecular Phylogenetics and Evolution 40(1): 29-49. Thieme O. 1907. Monographische bearbeitung der Gattungen Lasiophila Felder, Daedalma Hew., Catargynnis Röber, Oxeoschistus Butl., Pronophila Westw., Corades Doubl. Hew. 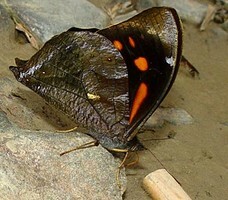 (Lepidoptera Rhopalocera. 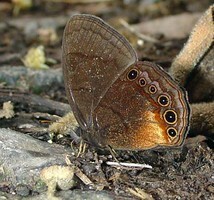 Satyridae). Berl. Ent. zeit. 51: 99-234, plates 3-5. Viloria AL. 2003. Historical biogeography and the origins of the satyrine butterflies of the Tropical Andes (Insecta: Lepidoptera, Rhopalocera). In: Morrone JJ and Llorente-Bousquets J, eds. Una perspectiva latinoamericana de la biogeografía. México, D. F.: Las Prensas de Ciencias, Facultad de Ciencias, UNAM. 247-261. Viloria, A. L. 2007 (2004) Some Gondwanan and Laurasian elements in the satyrine fauna of South America. Trop. Lepid. 15, 53-55. Page: Tree of Life Pronophilina Reuter 1896. Authored by Andrew V. Z. Brower. The TEXT of this page is licensed under the Creative Commons Attribution License - Version 3.0. Note that images and other media featured on this page are each governed by their own license, and they may or may not be available for reuse. Click on an image or a media link to access the media data window, which provides the relevant licensing information. For the general terms and conditions of ToL material reuse and redistribution, please see the Tree of Life Copyright Policies.